Welcome to DELVE Interviews, a look into the unique paths of artistic and creative individuals. These conversations are a branch of our DELVE Workshops and Networking Events, where we celebrate and discover everyone's unique paths as artistic and creative forces. It's a chance to learn from others, meet new people and see where our worlds overlap. This past September, we had the pleasure of meeting damali abrams when she spoke at our DELVE Networking event at Cue Art Foundation. damali is a New York City-based artist working primarily in video. She received her BA at New York University and her MFA at Vermont College of Fine Arts. damali was a 2009-10 A.I.R. Gallery Fellowship recipient. Her work has been shown in New York, New Jersey, Philadelphia, Memphis, New Orleans, Denver, and Miami. 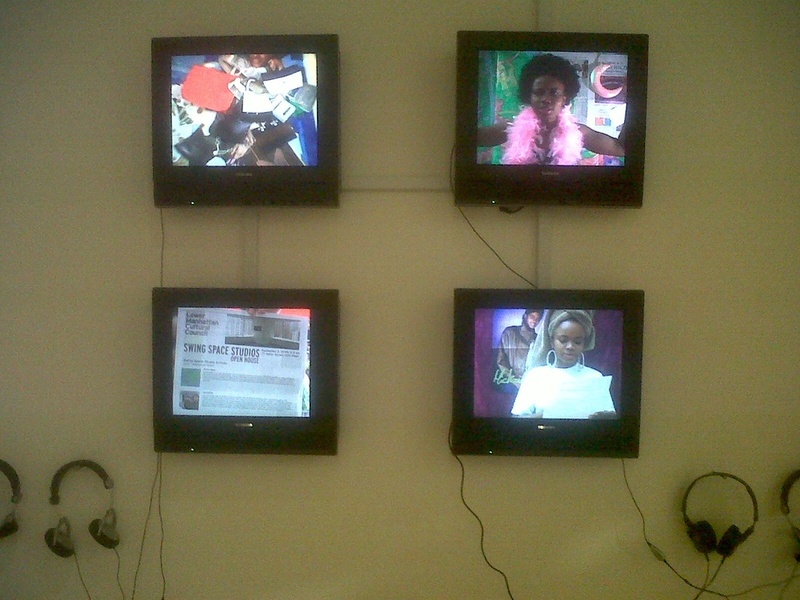 In New York City, her work has been exhibited at The Museum of Contemporary African Diasporan Art (MoCADA), A.I.R. Gallery, JCAL, Rush Arts Gallery and BRIC Rotunda Gallery, among others. Her work is included in this year's Bienal at El Museo del Barrio. damali is a member of the women's artist collective tART and one of the NYC coordinators for The Feminist Art Project. She is currently working on a performance art documentary, posting one chapter each month online, as part of an offsite residency with the organization Fresh Milk in Barbados. Can you describe your path as an artist–from where and when you began, until now? I started as a little girl wanting to be a dancer and a writer. I was on that path until the end of college. Then I started to make collages and decided to pursue visual art. Five years later I entered the MFA program at Vermont College of Fine Arts (VCFA). After graduating I began submitting my work to a lot of exhibitions and other art opportunities, which I continue to do now. I just completed a dual artist residency at Fresh Milk in Barbados with one week at Groundation Grenada. So a day in my life in Barbados was as follows: In the morning I'd walk down the road (past the horses and the cows) to the studio at Fresh Milk and stay there until sunset editing my documentary and covering things in glitter. It was a dream. I have two favorites: Autobiography of a Year & Baby It Couldn't Have Been You That I Feared. Autobiography of a Year is a four-screen video installation currently in the Bienal at El Museo del Barrio, Here is Where We Jump. For that piece I recorded daily video diaries each day of 2009, often wearing different costumes. Baby It Couldn't Have Been You That I Feared is a music video based around a rap song that I wrote and performed. My brother Kwesi also wrote and performed a verse. The beat was provided by the amazing DJ Metaphysic, who also appears in the video, along with my former partner Shadagga. The video is a montage of news clips obsessing about "high rates" of unmarried Black women, as well as other portrayals of Black women in the popular imagination. What's the most valuable lesson you've learned from all of your collaborations? Collaboration is a really amazing way to learn about art and myself. I learn so much from everyone that I collaborate with. I guess the most valuable lesson is to keep an open mind as well as an open heart and really use the opportunity to get out of my comfort zone and try new things. Being near water really inspires me. It can be the Hudson River or the ocean. Traveling also inspires me.